Solartron Analytical, specialists in the design of precision impedance test equipment, has joined forces with high temperature Furnace specialists Carbolite, and sample holder specialists NorECS to produce a range of advanced high temperature materials characterization test systems. The system uses a split tube furnace design together with a lab jack that allows easy sample access and positioning. The sample is positioned in a purpose designed sample holder between platinum electrodes that allow testing at very high temperature. Gases may also be applied to either side of the sample for solid oxide applications. Operating range room temperature to 1200ºC using a precise Eurotherm 2000 series temperature controller. Various sample types can be accommodated, disk, bar etc. 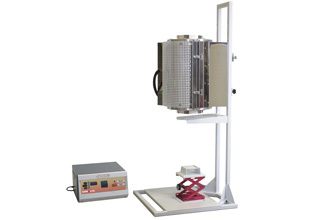 The 129620A high temperature furnace with 129621A/B/C sample holder options may be used together with various Solartron materials test systems to run I-V, Pulse, C-V, Impedance, Mott-Schottky and a wide range of other materials test techniques, fully integrated with temperature control. PC software provides fully integrated electrical measurements with temperature control. Sample vs. reference and normalization techniques are provided for improved measurement accuracy. heated zone) using a desk top stand.